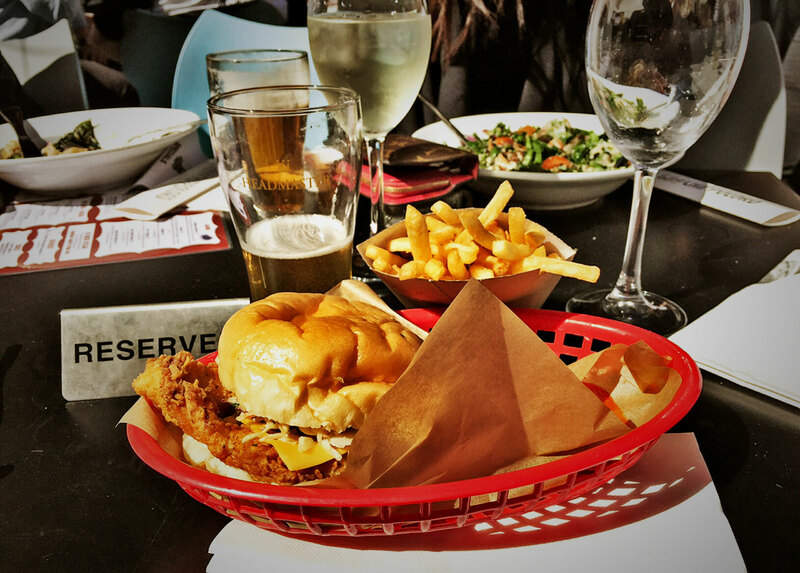 Squawk: When we asked locals where the best chicken burger in the neighborhood was, the answer was unanimous. So we went straight over to the Lord Gladstone with high hopes. The chicken is very, very nice. Fried, but not too crunchy or oily and the white meat was moist and tender. We enjoyed the string fries and the plain paper chip holder they came in. Buaawk: Sadly the Happy Rock wasn’t as much a winner as we’d hoped. But it could be some of that was just bad luck. For example, while the chicken was good, and the portion generous, we felt it needed more complimentary flavours – it was light on slaw and the Sriracha mayo was non-existent so overall it was dry and bland. We also were told they had Franks Hot Sauce which could have given this one a serious nudge, but we only found out after we’d finished. To their credit, Sriracha was on offer, but given the choice, this burger begs for Franks. They make sort of a big deal about the bread calling it an “New York style soft bun,” but it was pretty plain, and very sweet. For now we’re calling it low, but we will go back – to give the kitchen another chance to find the slaw and for us to find the Franks. Note: Look for our other review of their special KFC Korean kimchee chicken burger coming soon.